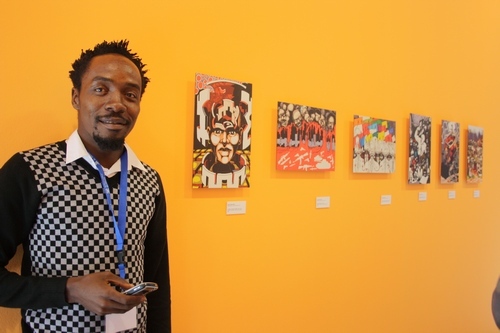 A political cartoonist and graphic novelist originally from Equatorial Guinea was arrested last week in the capital city of Malabo and is being held without charge. Ramón Esono Ebalé, who now lives in Paraguay, had briefly returned to his native country in order to renew his passport. According to Human Rights Watch, Ebalé was arrested along with two Spanish nationals while leaving a restaurant in Malabo on Sunday evening. The Spaniards were released after questioning over their connection to Ebalé, but the cartoonist himself has not yet been taken before a judge (required under Equatoguinean law within 24 hours) or charged with a crime (required within 72 hours). Human rights advocates fear that authorities intend to charge Ebalé with criminal defamation for his often-lewd caricatures of Equatorial Guinea’s dictator Teodoro Obiang Nguema Mbasogo. Obiang has ruled the small country on the west coast of central Africa since 1979, earning a reputation for brutal repression of journalists, dissidents, and political activists. In recent years the crackdown has also spread to artistic domains including theater and popular music. Graphic novels are a powerful medium for story-telling and satire. They allow us to penetrate into spaces that conventional media, radio, and TV do not reach, especially in repressive societies. Through the fictional perspective of the comic, Jamón y Queso captures how unreal and absurd life in Equatorial Guinea can be. Up to now, most of Jamón y Queso’s vivid and superb work has only been available online or displayed in galleries, limiting his ability to reach his target audience: the people of Equatorial Guinea. Internet service inside the country is limited. By publishing his graphic novel on paper, citizens will be able to pick up a copy and see their country in a different way. This is more than a graphic novel: it is an educational tool to show the people of Equatorial Guinea a reality different than the one on display on state-owned television and radio.